Did you know that mental illness is a leading cause of disability in the United States? According to the Substance Abuse and Mental Health Services Administration (SAMHSA), 1 in 5 adults and 1 in 10 children in America are affected by mental illness. Yet, nearly 2 of every 3 persons with a mental illness diagnosis do not seek treatment. Especially for minorities, social stigmatization, cultural beliefs and myths, and availability of mental health services rank among the greatest barriers to getting help. 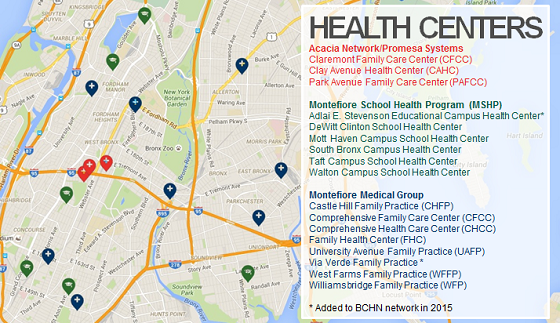 BCHN's 17 Bronx-based community and school health centers offer integrated, co-located mental, medical and oral health care with social work counseling and related support services. We can all play a part in raising awareness of mental illness and dispelling stigma in our homes, workplaces, houses of worship and communities. Learn more about mental illness and speak out about your experiences. Encourage loved ones, friends and colleagues to learn more, and make it easier for those affected to speak out about their own mental health journey, or as allies for loved ones. For more resources, visit: Substance Abuse and Mental Health Services Administration; National Alliance on Mental Illness; or mentalhealth.gov. 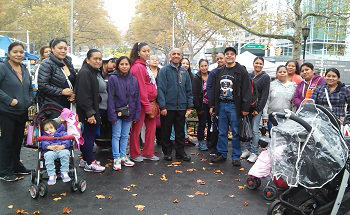 With the July opening of the farmers' markets in the Bronx, BCHN's community health workers have kicked off the 2016 farmers' market walking groups. The walk from University Avenue Family Practice already began its new season, led again by Pedro Gonzalez. Also, a walking group of patients from Family Health Center at Fordham Plaza is being led by heatlh educator Alexandra Pamiloza, in conjunction with community health workers Aminatta Ulaba-Samura and Lilibeth Castillo. Both groups walk to the farmers' market at Poe Park. Summer squash is one of the healthy items currently in season which can be purchased at the farmers' market. 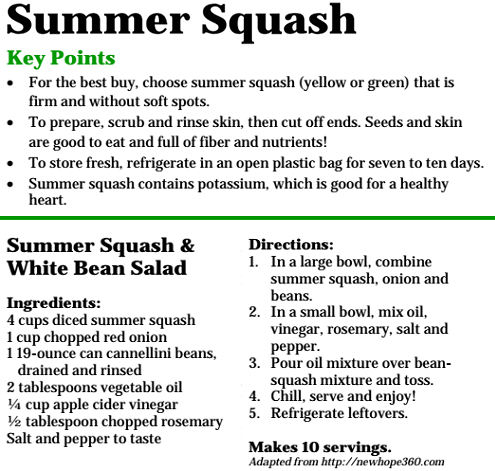 Perfect for preparing summer squash and white bean salad - check out the recipe below. New York State Senator Gustavo Rivera and Assembly Member Victor M. Pichardo co-hosted the 3rd Annual Senior Health Fair on July 22 in King Hall at Monroe College. 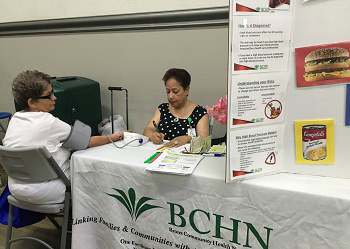 BCHN's community outreach team—including Emma Torres (pictured), Yaritza Holguin and Lilibeth Castillo—provided blood pressure screenings, conducted a "Salt Matters" demonstration, and provided information about blood pressure and heart health. Congratulations to health educator Arousiag Markarian, a recent addition to the BCHN community outreach team. She is now a Certified Asthma Educator, having passed her exam on July 20. Community health worker Rhea Chandler attended the Healthy Start program regional meeting, in Connecticut, from July 18-20. Grantees from New York, Massachusetts and Connecticut joined forces to strategize and share information on their Healthy Start program, which provides education and support on pregnancy, childbirth, parenting, breastfeeding and healthy living. 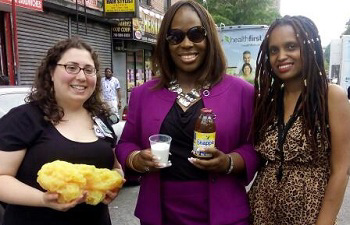 At Council Member Vanessa L. Gibson's health and wellness fair in June, our outreach team educated attendees on the amount of sugar contained in juices and soft drinks. In the photo, Arousiag Markarian displays a 5-pound fat model, while Council Member Gibson displays a 16-ounce bottle of Snapple containing the equivalent of 13 teaspoons of sugar. 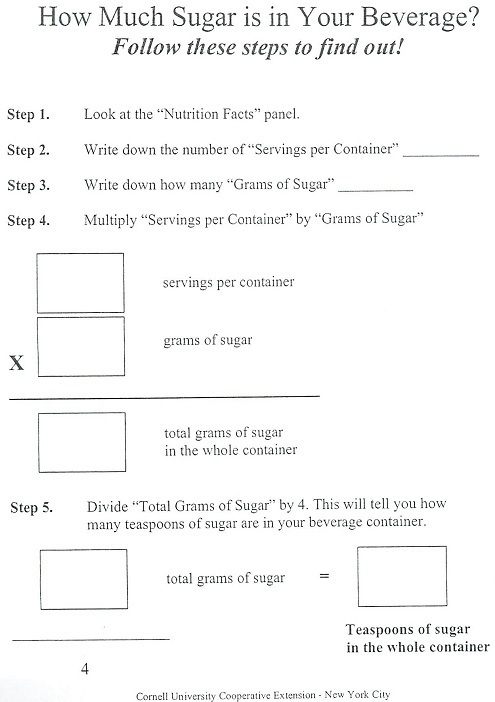 Would you like to find out how much sugar is in the beverages you drink? Use the simple formula below to find out! * Making beverage vending machines and healthy beverages available at meetings. * Making healthy snack options available at food vending machines. * Making healthy food options available at meetings and special events. 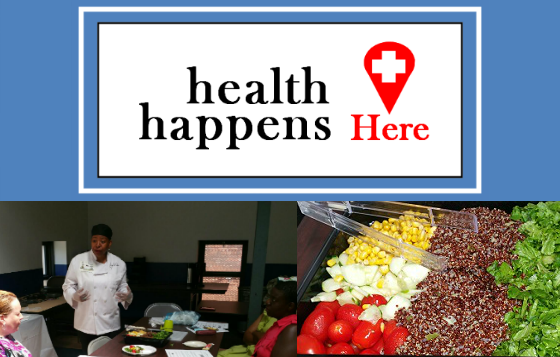 Bronx REACH CHAMPS held a Worksite Wellness Forum on July 18 and 19 at the offices of Community Board 12. The event featured presentations from BCHN's Renee Whiskey and Paulette Spencer, and educated representatives from local organizations on how to become a Health Champion at their workplace. At the Worksite Wellness Forum, Chef Wilson offered tips on healthy eating at the office, reading food labels, and the importance of portion size. 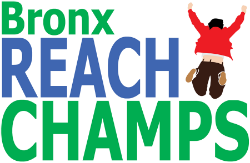 Bronx REACH CHAMPS is particularly interested in working with organizations in the north and central Bronx. To find out more about how to become a Health Champion at your work site, please contact Renee Whiskey at rwhiskey@bchnhealth.org or (929) 220-8182. The Bronx REACH CHAMPS Parks and Open Spaces Coalition met on July 20 to review the latest status on the initiative, aimed at increasing physical activity at local parks. 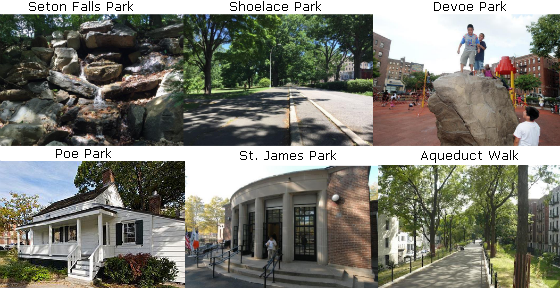 Six locations (see below) have been selected for enhanced programming that will increase the use of the parks for physical activity. 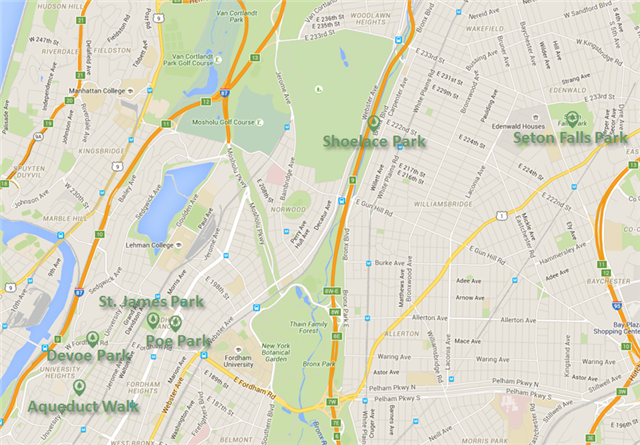 New Yorkers 4 Parks is currently collecting baseline data at the parks to gauge the current usage level. Enhanced programming at the parks will begin with two free classes on July 30 at Devoe Park. Kathryn Davis will lead Qi-Gong Meditation from 10:00-11:00AM, followed by a physical fitness class (to be announced) by N'Namdi Nelson from 11:30AM-12:30PM. Check out the schedule of classes here . 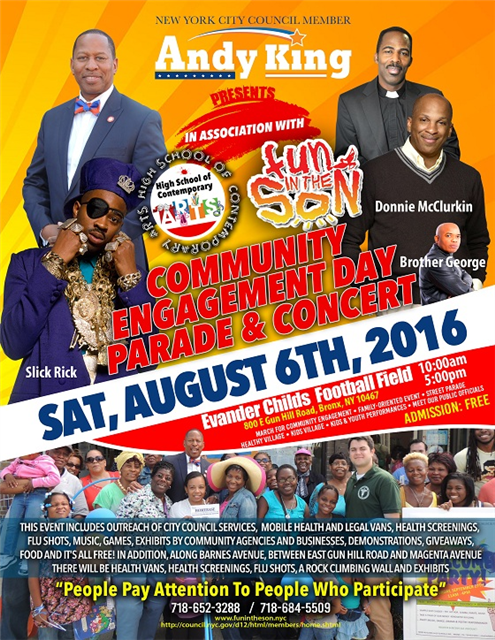 The Community Engagement Event will he held on Saturday, August 6, with the parade kicking off at 10 a.m. at the corner of East Gun Hill Road and Boston Road, Bronx, and proceeding along East Gun Hill Road to the Evander Childs football field at 800 East Gun Hill Road. All other events will take place along Barnes Avenue, outside of the football field, between East Gun Hill Road and Magenta, or on the football field itself. 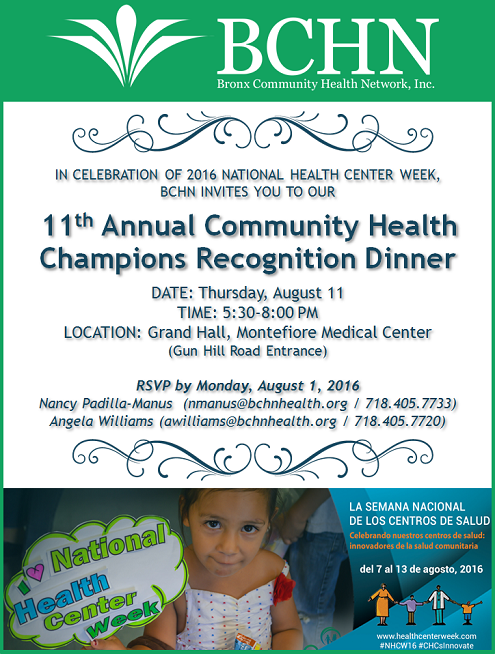 BCHN invites you to attend our 11th Annual Community Health Champions Recognition Dinner on Thursday, August 11 at the Grand Hall of Montefiore Medical Center (Gun Hill Road entrance). Every year during National Health Center Week, BCHN recognizes patients who have made remarkable strides in meeting their self-management goals. We also honor partners who have made a significant contribution to the Bronx community. 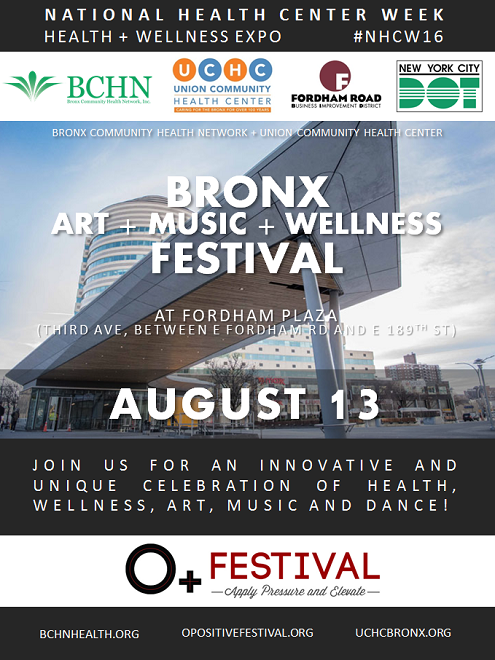 On August 13, from 10:00AM-3:00PM, in celebration of National Health Center Week, Bronx Community Health Network and Union Community Health Center, along with Fordham Road Business Improvement District, the NYC Department of Transportation and O Positive, will host a Health and Wellness Expo at Fordham Plaza in the Bronx, NY. All are welcome to join us for an innovative and unique celebration of health, wellness, art, music and dance. Come out and learn more about the health & wellness resources available to you right in your neighborhood!